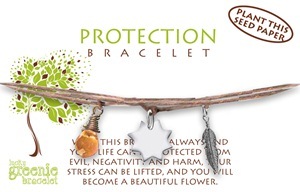 Wear this bracelet always and your life can be protected from evil, negativity and harm, your stress can be lifted, and you will become a beautiful flower. Comes on plantable seed paper. For every four greenies we plant one tree. Be a greenie, change the world.